All transitions are about movement from one state of being or thinking, to something new and unknown. Clinging to our comfort zone can be a way of resisting that movement. We might not even be aware of how we dig in our heals to avoid the fear of something unfamiliar. 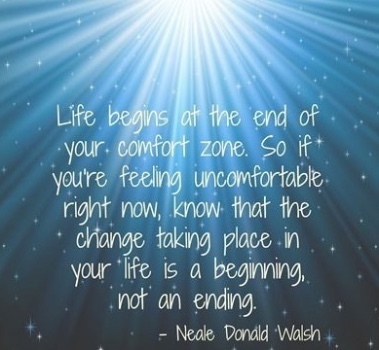 Do you know what your comfort zone is? Mine has always been the safety of predictability. Anything that challenges what I know to be steady and sure sends me into a tailspin of anxiety and panic! Life transitions certainly challenge our safety and predictability. We can be thrown off balance and set adrift when going through divorce, job transition, aging, retirement or bereavement. Suddenly nothing is the same. The jars we have stored filled with our experience and knowing have been shifted around, lost or moved. No wonder we can’t find what we are looking for! Here is the point of seeing our transition as an ending and something to be grieved. This is a place of putting up barriers instead of finding pathways forward. New beginnings in any of these life changes cannot start until we have felt the discomfort of loss, grieved what is no more, and released what keeps us immobilized..
What stands in our way of coping with change? What makes it so hard to let go of what we know? By looking at what I consider to be the Top Five Barriers to Change, we can open our awareness to what we place in our own way when a transition comes up. Only from that point can we understand, heal and learn in order to move forward. Fear of change can trigger our internal defense systems and fool us into thinking we have perfectly good reasons Not To Change. * We can become indecisive and confused. we end up doing less than we are capable of. succumb to our fear of failure which will keep us from taking risks. * Give yourself a break! life change. What do you see? yourself not to change. “I could NEVER DO THAT!” might be how you talk yourself out of taking a new job or entering into a new relationship. Maybe you hide behind “imposter syndrome” and fear others will see you for the fake you believe yourself to be. In this process you can create and live out your own self-fulfilling prophesies. * Who might you feel safe with to be able to let down your mask with? * Work on nurturing and developing your sense of personal power. * Be aware of your self talk and the messages of “not good enough” . * With your awareness, make a choice to challenge your “not good enough” message. beginning of being able to let it go. Do you hold yourself to an impossible standard of being perfect? Aiming for excellence is the opposite of demanding perfection. When we are stuck in the grip of perfectionism, we are also stuck in “all or nothing” thinking. There is no flexibility, self-compassion or give with that kind of outlook. We might take to procrastinating on a project, task or decision just to avoid the possibility of failure, especially if we are expecting perfection. aiming for excellence and demanding perfection. * Allow for compromise and flexibility. to hold yourself to an impossible standard of perfectionism? * Try asking for what you need and see what happens. * Allow yourself to be open to the support of others. * Work on decreasing your negative self-criticisms. * Center within and allow self-validation. Whatever life transition you find yourself in next… be aware of these barriers to change. Think especially of the ones that are your favorites… the ones that keep you the most stuck. With awareness, understanding and self-compassion, you can find a different path around these barriers. If you get stuck, give me a call! I’m here to help!